For Immediate Release – December 13, 2017 – Oklahoma City – There were many shining moments at the 2017 National Reining Horse Association (NRHA) Futurity & Adequan® North American Affiliate Championship Show, from the Hall of Fame Induction to the singing of Run for the Roses. One moment that will forever stand out in the NRHA history books is the addition of a new Million Dollar Rider—Franco Bertolani. 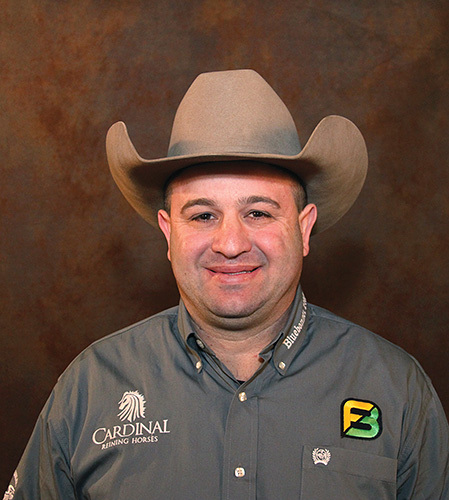 Bertolani is a Brazilian native and is currently the head trainer for Cardinal Reining Horses. During his reining career, Franco has had many significant accomplishments, including Reserve Champion in the 2016 NRHA Level 4 Open Futurity. In 2016, he also won the All American Quarter Horse Congress Level 4 Open Futurity and the Tulsa Reining Classic Level 4 Open Futurity, all of which were done aboard Dun It For Whizkey (Topsail Whiz x Dun It for Chex), owned by Cardinal Hill Training Center LLC. During the 2017 NRHA Futurity, Bertolani competed with two half-siblings owned by Cardinal Hill Training Center LLC in the Lucas Oil Level 4 Open Futurity Finals. Masked Gun (Gunner x Dun It For Chex) placed fifth and earned $45,062.63. Chex For Nite (Gunners Special Nite x Dun It For Chex) placed twentieth and earned $10,540.92—bumping him across the coveted million dollar mark. Congratulations to Franco Bertolani for achieving this huge accomplishment as an NRHA rider!